In Huffenpuffen Valley, dragons and humans live peacefully side by side. The dragons are very well-liked because they are really useful companions – in the winter they light bonfires and fireworks, and in the summer they help with campfires and roast corn on the cob with their flames! But there’s one dragon who is a little bit different. Jasper breathes water instead of fire! He tries his absolute hardest to assist the people in the valley but the jets of water he sprays just leave them cold, wet and unhappy. Poor Jasper decides that the best thing to do is leave the people alone and just be by himself. 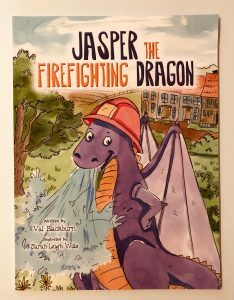 Then one day a fire breaks out at a nearby house and Jasper realises he can help. He swoops down and sprays his water through the windows and over the roof and soon the fire is distinguished. Jasper has saved the day! He may not be able to breathe fire but it turns out he has a very bright future ahead of him as a firefighter. The message in this lovely book is loud and clear – it is okay to be different! It teaches your child that it’s good to be unique and that your special differences are the very things which make you, you. The colourful illustrations do a great job of conveying the different emotions experienced by the water-breathing dragon (and those around him). Ivy loves to pick out the happy and sad people as we read the book and gets very excited when (spoiler alert!) Jasper is fully accepted by the villagers at the end.